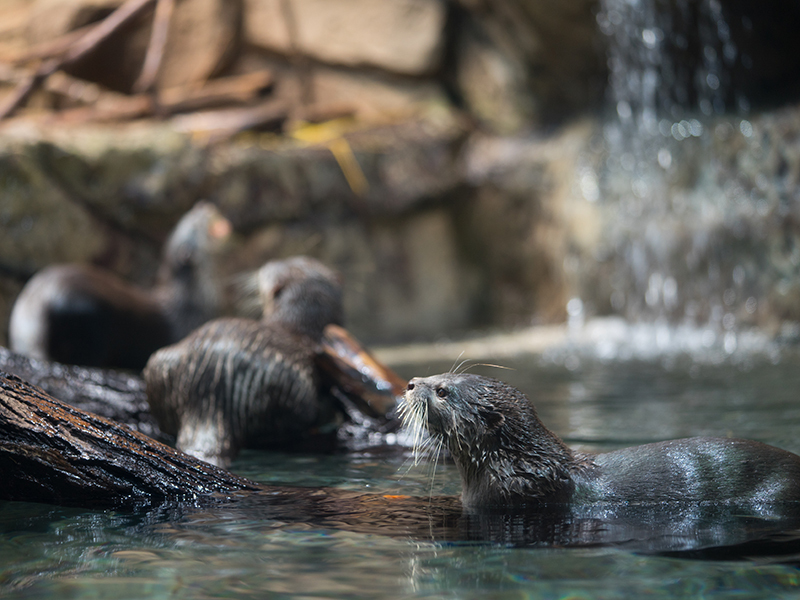 Wander among the native species of Southern Asia in our newest gallery, Expedition Asia, where you are welcomed by Asian otters, giant fish, and our Clouded leopards, Koshi and Rhu. 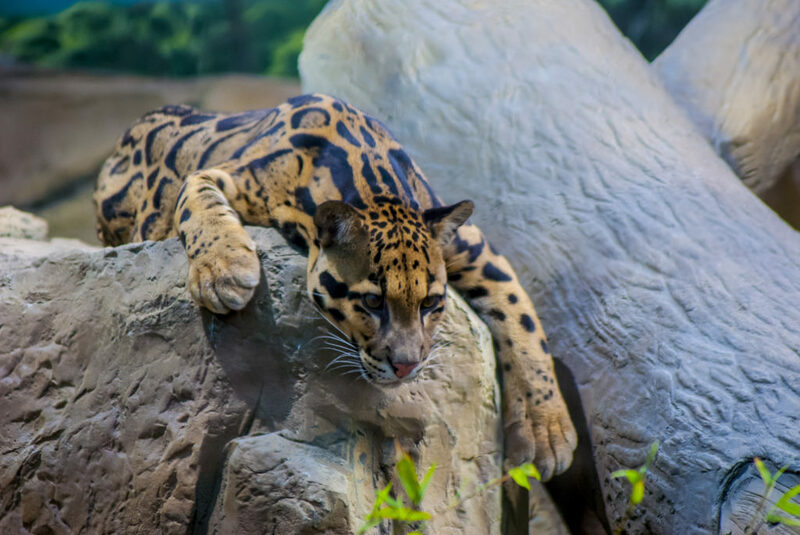 Clouded leopards can be found in the Himalayan foothills, Southeast Asia, and China.. They primarily live in lowland tropical rainforests but can also be found in dry woodlands and secondary forests. Clouded leopards usually stand 10 to 16 inches tall and are between four and six feet long. They feed on birds, monkeys, squirrels, porcupines, deer, and wild boar. Conservation Connection: Clouded leopards are listed as endangered under the US Endangered Species Act. Hunting and deforestation are resulting in the decline of population. Did You Know? Clouded leopards are the closest living relative to the Saber-toothed cat. Asian arowanas can be found in a diverse grouping of freshwater systems in Southeast Asia and Indonesia. They are mostly found in forest-covered streams but are also seen in lakes, deep parts of swamps, flooded forests, and stretches of deep rivers. Asian arowana can grow up to three feet long. The Asian arowana will eat insects at the water surface as juveniles, and fish and other small vertebrates as adults. 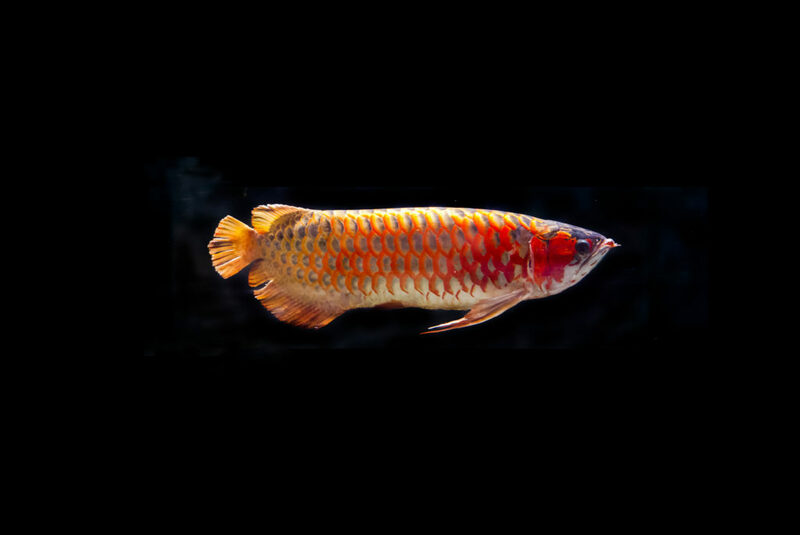 Conservation Connection: The Asian arowana is an endangered species due to the high threats of hunting and habitat destruction from various human activities. International trade of this species of tightly restricted. Did You Know? The Asian arowana is the most sought after aquarium fish in the world. The highest known price was $300,000 and was supposedly sold to a high-ranking member of the Chinese Communist Party. Small-clawed otters can be found in Southern and Southeastern Asia. These otters live in freshwater systems, usually natural occurring streams or lakes with vegetation used as a cover. On average, small-clawed otters can grow to 1.5 to two feet long and weigh two to 11 pounds. Small-clawed otters are carnivorous and have a diet that consists of insects, birds, eggs, small fish, amphibians, rodents, snakes, worms, and snails. Conservation Connection: Due to habitat loss, more otters live near human communities. They also have a high threat from human poaching for their pelts and meat. Did You Know? Unlike other otter species, these otters are more social and tend to live in extended families with monogamous parents. Binturongs are widely distributed throughout South and Southeast Asia. They can be found in a variety of forests from evergreen to secondary lowland forests. Binturongs have a body that will range from two to three feet and tails that can be as long as 33 inches. They will typically weigh between 30 and 50 pounds. As Omnivorous creatures, Binturongs have a diet that includes insects, fruits, birds, rodents and fish, earthworms, and eggs. 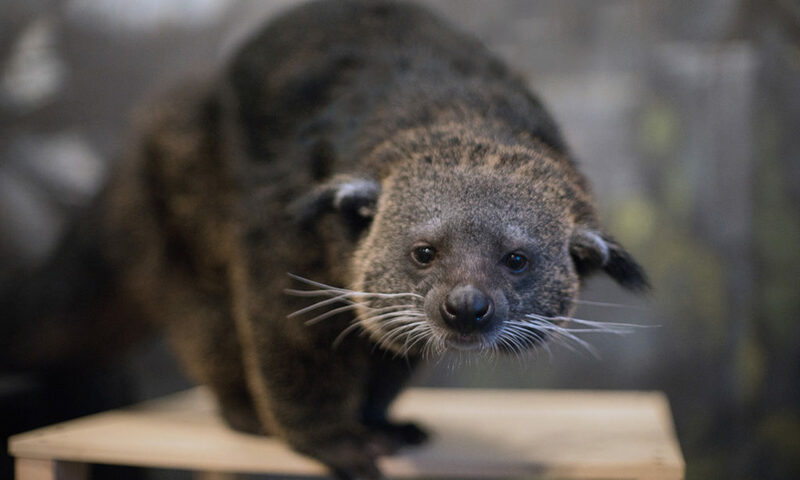 Conservation Connection: Binturongs are considered a vulnerable species due to a 30 percent population decline over the last 18 years. Their highest threat is habitat loss and degradation, over-hunting, and capture for pet trade. Did You Know? Binturongs smell like buttered popcorn. This is due to a compound in their urine which shares a similar chemical compound to one found when heat causes a reaction between the amino acids and sugars in a kernel of corn during the popping process.